Oh. One more thing I should mention. This is the easiest recipe for a quick Strawberry Shortcake (just in case that matters). This is a cake that you will make over and over again for every Spring-time event that you attend. You may just even make it for your own little one-person kitchen party. I have those often. Don’t you? And if you are serving this to a party full of gluten-eating guests, not one of them will ever guess that this is gluten and dairy free. I know. I have done this. Many times. And I get rave reviews each time. I also rarely reveal what it is actually free of. What does it matter to them if it is gluten free? This cake is a perfect replica of the Strawberry Shortcake that my Mom made throughout my entire childhood. I have the fondest memories surrounding this cake. So, I felt compelled to copy it. And copy it I did (even managing to make it a little bit healthier). This cake is so ultimately moist and buttery-rich tasting! And the best part? It literally has the consistency and sponge-like texture of a gluten-filled cake. I am not kidding you. Try it. You will be shocked. I am also sharing this recipe with Kelly, over at The Spunky Coconut for her fun Easter Holiday Event that she is hosting. She will have an entire Easter Feast ready for you. Make sure to check out her round-up of Gluten-Free Holiday recipes. And as strawberries are coming into season, what could be more perfect than a Strawberry Shortcake for your holiday event. I know that this one will be on our table without a doubt. 1. Preheat Oven to 350 degrees. Grease an 8 inch x 8 inch pan on the bottom and sides. Then cut a piece of parchment paper to fit just in the bottom of pan, without letting it go up the sides. 2. In medium bowl, mix together Superfine Brown Rice Flour, Almond Flour, Millet Flour, Arrowroot Starch, Baking Powder, Baking Soda, and Sea Salt. Whisk together until light and airy. 3. In bowl of electric stand mixer, beat Butter (or Earth Balance) and Sugar for 3 – 5 minutes until light and fluffy. Then add eggs (or Egg Replacer), one at a time, continue mixing. Add Yogurt and vanilla and mix again until incorporated. 4. While mixer is going on low speed, slowly add dry ingredient mixture. Stop occasionally to scrape down sides with rubber spatula. Once all dry mixture is added, continue to mix until well-incorporated and batter seems light. 5. Pour half of batter into prepared pan. Then lay half of strawberry slices over batter. Sprinkle 1 Tbsp Coconut Sugar over strawberries. Then add remaining batter over strawberries. Place remaining strawberries all over the top of the batter and sprinkle last Tablespoon of sugar over strawberries. Design is not necessary since the cake will move the berries around as it rises (and possibly even cover them). Enjoy! This cake is wonderful! And I hope I am not just being biased. Report back if you make this and let me know if you agree with me. What will you be serving for your holiday meals? I love to see the varied menus (and get new ideas myself)! Gorgeous, Kim! I had only read about this recipe some minutes ago on my Facebook feed – and now it’s here. 😉 I have to step on my Easter recipes, I’ve posted a sidebar poll on my blog but that’s about it so far. Beautiful! I’ve always had strawberry shortcake with biscuits, of which my gluten free attempts have been sorely lacking recently. Is this technically a quickbread? It’s lovely! This looks absolutely gorgeous Kim, so wish I could break out my millet flour right now (patience Heidi, all good things…). Can’t wait to share this recipe with my readers, yummy! Heidi, I cannot even imagine how many recipes you must be bookmarking for when you can add all of your eliminated ingredients back in! You are going to be one crazy-cooking mama!! LOL I want to pay a visit to your kitchen once you are off your elimination diet!! Oh this looks so scrumptious. It’s going to be the very next thing I bake once I get all these cupcakes out of the house. Maybe I should waylay the kids when they get off the school bus? OK Creepy. I’ll just have to advertise for alternative stomachs on Craig’s List. 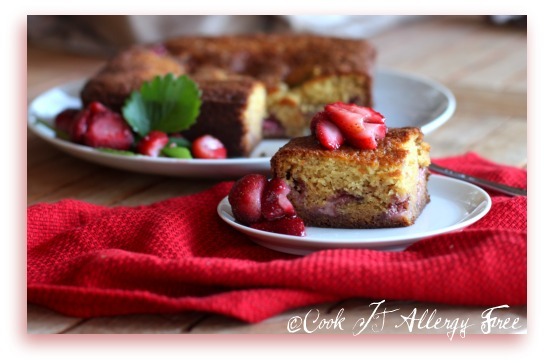 Wow, Kim this looks amazing – moist, tender crumb and with that strawberry shortcake flavor my kids love! Thanks for such an incredible recipe. This looks delicious! 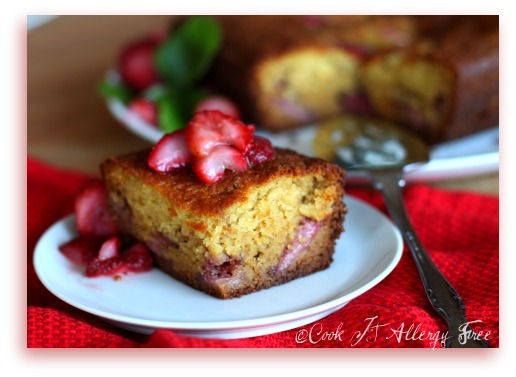 I made a strawberry bread last summer and I loved the texture and flavor from the fresh strawberries. We normally do a coconut cake for easter, other than that, we don’t really have a usual meal. YUM! I LOVE that you gave vegan options! Can’t wait to try this. Thanks! This looks absolutely scrumptious, Kim! Thank you for choosing So Delicious Coconut Milk Yogurt to create this delectable recipe! Maggie, i will pack a piece of this cake just for you in Chicago!! Cannot make promises on it’s state once we arrive though. LOL And thanks for your kind words! So excited that we will be seeing each other in just 2 weeks! EEEKS! Kim, this cake was absolutely delicious! I made it for my hubby’s birthday today and substituted hazelnut flour (as we have an almond allergy). Also used your egg substitute. The cake rose beautifully and was so moist. I’m so thankful you posted this recipe as I was agonizing over making an allergy friendly cake that everyone could enjoy. We enjoyed your cake with vanilla and strawberry ice cream (dairy free – made with coconut milk). Everyone raved about the cake and several of the boys had seconds! Wow! This is the most gorgeous Strawberry Shortcake I have ever seen. It looks very moist and yummy. Thank you for sharing the recipe. Your recipe sounds and looks delicious! I had not heard of coconut yogurt but I’m definitely interested in it. I’m dairy free as of a couple weeks ago as well as egg free and I am struggling some in finding recipes that are appealing to me. I’m comfortable with the g/f flour combinations but the d/f and e/f are throwing me a curve. Do you have any suggestions on where I might find the coconut yogurt? I just went back and reread your post and clicked on the So Delicious link and found out that there are a couple of stores in my little town that carry their products. I’m going to check them out tomorrow and hopefully, yogurt is one of their products in stock. Thanks so much for the link. Also, I was wondering if your egg sub. works in bread recipes? I have tried just using the EnerG egg sub. and the bread turned out good but very dense. Your strawberry cake looks just stunning & fabulous even! MMMMM,…lovely food best enjoyed with family of good friends! Hi Sophie! I agree good food is even better when you share it with family and friends! Have a beautiful weekend! This looks fantastic. Can’t wait to try it. Been looking for a strawberry short cake. You are unbelievable! this looks fantastic Kim. And no need to be modest, toot away! Thanks Christine! Hope you like it. I just made your strawberry cake and it was great except that it tasted like it had too much baking soda. Does your recipe really call for a tablespoon of baking soda and baking powder? Should it be a teaspoon? I would love to make this again with less baking soda. Hellana, thank you so much for reporting back. That should 1 tsp, not 1 Tbsp, baking Soda. Yikes. Now fixed. The strange thing is that I have had many emails from people telling me how much they loved it. I wonder if they were just being nice and not mentioning that it tasted like baking soda? LOL Anyway, I really appreciate you coming back and letting me know. I look at a recipe so many times times before I publish it, and am surprised I looked at that so many times and missed it. I hope you try it again sometime and let me know if you think it is any better without all that baking soda. Hope you have a wonderful weekend. Thank you again! Hi sorry to bother you again. Is it one tablespoon or teaspoon of baking powder? I want to make this again tonight. By the way, your stuffing for thanksgiving was the best ever. My family and I have enjoyed it many times since thanksgiving. Hi Hellana. No bother at all. Gluten Free ingredients are expensive, so do not feel bad for asking. It is still 1 Tbsp of baking powder. That is what will help this cake rise. Let me know what you think this time around. By the way, which brands of flours did you use? The cake was delicious!!! The whole thing is gone. My husband froze a few pieces for breakfast but most of it was eaten with dinner. Big hit. I will definitely make it again. I used all Bobs Red Mill flours but I put the brown rice flour and the almond flour in the blender to make it a little finer. What a phenomenal recipe!! I have been looking for a great GF strawberry shortcake recipe for a while and glad I found it here. I love your blog, BTW. I recently started my own. After growing up with a deadly nut-allergy, and discovering several intolerances along the way, I think it’s both important and inspiring to support each other in our love of food and creativity in the kitchen. Thanks Erica. I am glad you like the Strawberry Shortcake. I’ll go and check out your new blog now. That Honey tart sounds delicious! I just had to let you know that I tried this recipe and it was Amazing. Found your blog through So Delicious on FB, but now I’m definitely going to look at your other recipes because this one was Amazing. Even though I substituted like crazy due to allergies and what I had on hand lol So, I used sweet rice flour instead of almond flour, soy flour instead of millet, and tapioca starch for arrowroot, Willow Run margarine, and chia eggs (1 T chia and 3 T warm water per egg). It rose beautifully, was light and sweet, and as soon as I get my hands on more strawberries I’m making another. Hi! I have been looking for a healthy cake recipe for my daughter’s upcoming first birthday. There are some concerns about giving babies strawberries, so I was thinking about trying this recipe with bananas and blueberries. Have you ever tried fruits other than strawberries? Thank you! Hi Caitlin! I am so sorry that I just saw this. It somehow got buried. First off, Happy Birthday to your daughter! And, you could make this cake with peaches now that it is starting to be peach season! I have made this with peaches as well and it was delicious! But, bananas and blueberries would be a delicious combo as well! Good luck! Let me know what you decide to do! My mouth is seriously watering; this is a perfect summertime dessert and I can’t wait to create it next weekend when I have company over! Thank you for sharing; enjoy your holiday weekend. 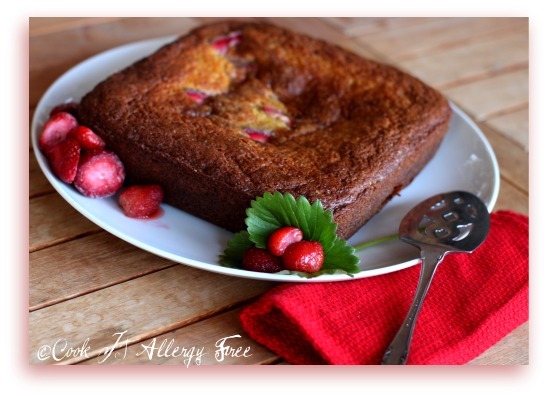 Truly love your blog and tasty allergy-free and (very delicious) recipes! Never commented on any recipe before…this is divine 🙂 I thank you as do my crew. Thanks so much, Meech! I am so glad that you like the cake!! Did you actually make the recipe yet? I have made it a handful of times and it’s now a family favorite! Yay! These are my favorite types of comments – they make my day. So glad that you and your family enjoy the cake! Thanks so much for reporting back and letting me know! great recipe! I am going to try it as soon as I get a chance!! I made this tonight and the flavor is excellent…i’m just not sure if the consistency was correct…it was quite moist…almost as if it was a tart…is that right? I cooked it for longer..about 55 minutes on 350 degrees. It’s still good…i’m just not sure if it is right.